The best solution for global workplace needs. Get yours today, or try it free for personal use. Workplace solutions offer remote connectivity, innovation, speed, and security. Bring your workforce closer together and manage them efficiently. Remotely connect to mobile, desktop, and IoT devices. Stay connected to your devices, anytime and anywhere. Connect to your global team anywhere through voice, video, instant chat, and screen sharing, on any device. Provide on-site assistance to remote locations with Augmented Reality support. Efficiently solve problems. Manage your IT services. Protect, monitor and track your devices and IT assets. Provide remote IT support. Discover remote management solutions that are scalable to your business. Get TeamViewer now! These remote desktop management solutions are designed to make remote management easier. Remotely control a Windows 10 mobile device, Android or computer. Connect from mobile to PC, PC-to-PC or mobile to mobile with ease. Get excellent security scalable to your business needs without the hassle and complexity of VPNs. Connect to devices using your mobile device. Access and secure unattended devices and computers. Get iOS screen sharing on your mobile device and provide support or connect to devices remotely. You can also flawlessly connect to UHD desktop displays with TeamViewer online. These solutions let you wake sleeping devices, install programs on them and restart them. You can use a local printer to print documents from devices you access remotely. Get access to secure and flexible file sharing methods. Make your remote business units function more efficiently with TeamViewer. Corporate solutions aim to make it easier for you to optimize your business efficiency. You can create channel groups to ensure the right people have access to the right channels. Get comprehensive reports on productivity and precision billing. Get ServiceCamp ticket management integrated to optimize your customer support process. Set permissions, policies and licenses across your organization. You can mass deploy TeamViewer across your organization automatically and silently. Organize and assign your service queue. Get support in 30 different languages, and integrate TeamViewer into your existing systems. You can also generate custom modules and tag them with your company logo. Add a custom branded touch to your IT support and services. Get access to a management console to track and manage your team. Collaboration is the name of the game, especially for organizations with remotely placed employees. Use virtual whiteboards to share ideas, brainstorm, and collaborate with your team online. Instantly communicate with people through text on the group chats, offline messaging and customer chat modules. Get access to HD VoIP video and voice conferencing solutions to make your collaboration attempts more efficient. Instantly manage devices and individuals in your team, no matter where they are physically located. Record compressed collaboration sessions to make your team meetings more productive. TeamViewer optimizes the way you collaborate across your organization. The more streamlined the communication between your employees, the better the productivity and efficiency. Get it now and get your team together, regardless of different physical or geographical distances. Get end-to-end security when you remotely control your devices with TeamViewer. 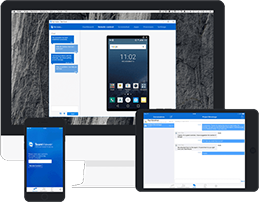 Securely access Android, Windows 10 and desktop devices. HIPAA compliance is an important need for many businesses in the 21st Century. Get remote access and support with the level of security you need to be HIPAA compliant. Protect your devices against malicious attacks. Get malware protection against Trojans, ransomware, spyware, viruses, and rootkits. You also get remote data backup capabilities. This means you can store data remotely and restore it in case it is lost in a disaster scenario. Get access to the remote monitoring dashboard with TeamViewer online. This lets you monitor and manage all your servers, devices, and websites from one easy-to-use console. Rest easy knowing your data, devices, and servers are secured against malicious threats. Get the app on iOS and Android devices and start remotely supporting devices using your phone. TeamViewer stands out because our staff loves using it. We haven’t found any other remote administration software that comes close. It’s able to adapt to a lot of different technical support issues, which keeps our customers happy.